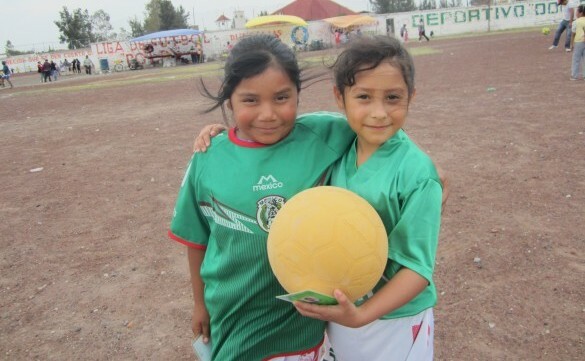 (MissionNewswire) Youth in Salesian programs in Mexico City, Mexico have better access to sports and recreation thanks to a recent donation of 5,700 fútbols. The donation was made possible through a partnership between Salesian Missions and One World Play Project (also known as One World Fútbol), an organization dedicated to bringing the healing power of play to youth worldwide by making, selling and distributing nearly indestructible balls that survive the harshest environments. Salesian sports teachers offered positive feedback about the donation. One noted that some of the children didn’t like to play sports, especially in the hot weather, but since the donation they are very punctual and little by little are starting to like playing, some even joining the soccer team. Another sports teacher noted that the children were surprised by the fútbols because they didn’t have to inflate them. The children noticed that the fútbols were different from ones they had before and it generated renewed interest from the young students. “When playing soccer I feel happy and imagine that I am playing soccer in a Champions League tournament because I want to be a professional player. I feel that this ball makes me faster and lighter, but when I hit the ball with my head, I feel it hard,” says Kevin, a 13-year-old who also received the donation. More than 46 percent of Mexico’s population lives in poverty, according to UNICEF. Close to 53 million people lack access to education, healthcare, transportation and even the most basic necessities such as food and shelter. Youth in the country face a higher rate of poverty at more than 53 percent which accounts for 20 million children and adolescents with 5 million of those living in extreme poverty. In Mexico City, the country’s capital, poor residents lack safe drinking water and sanitation. Incidents of crime and violence are high within the region. According to UNICEF, close to 240,000 abandoned children live on the streets of Mexico City and up to 90 percent of those have faced sexual exploitation by an adult.